Search our plumbing tips questions and answers below for the solutions to your plumbing problems. How can I get rid of the foul odor coming out of my garbage disposal? When food debris builds up in a disposer, it can cause bad odors to rise from the drain. Get rid of the smell by putting lemon or orange peels and ice cubes in the disposer and running it for 30 seconds. Then add a little dish soap, continuing to run the mechanism. Finish by running cold water while the disposer is on for about 30 seconds. This will rinse away any remaining debris. The rarely used basement bathroom is giving off a foul odor. How do I get rid of it? Plumbing systems use a trap with a water seal to keep bad smells from getting into the house. Sometimes, the water seal evaporates, and the smells work their way into the rooms of the building. Stop the problem by pouring buckets of water into the sink, shower and floor drains. Even though we turned off the outside faucets in the fall, the pipes leading to the outdoor faucet still froze and then broke. How do we avoid this in the future? In addition to turning off the water, disconnect garden hoses connected to outdoor faucets and let the water in the pipes drain out. This better equips the pipe to stand up to cold weather. Large, permanent roots support a network of small and temporary feeder roots. The smaller roots absorb most of the nutrients and water, and are found in the top 6 to 18 inches of soil. The entire root system might go as deep as two or three times the height of the tree itself, and in some cases seven times the tree’s height. The growth rate of the roots depends on soil depth aeration, water supply, temperature and mineral supply. Sandy and well-drained soil leads to more extensive roots than clay soil. What does weather do to root growth? Winter and drought conditions will allow roots to travel far in search of moisture. They’ll follow vapors coming from cracks and loose seals in sewer lines, and damage the lines by penetrating those openings. This can end up requiring emergency plumbing. What about when roots get into sewer lines? If left to grow, roots will invade the whole pipe with hair-like root masses. Everything that comes down your sewer line will catch on the roots, clogging the line and causing backups and slow downs. The pressure this puts on the pipe can cause breakage, which will require the assistance of professional plumbers. Clay, concrete and PVC are all vulnerable, but PVC has fewer joints, making it less likely to leak and cave to root pressure. What’s the best way to control roots in pipes? A Roto-Rooter plumbing contractor knows how to get rid of invasive roots with powerful blades. A Roto-Rooter Root Destroyer inhibits future growth and only kills the roots in the pipes. It will not hurt your tree’s roots. All you have to do is flush the solution down your toilet two times a year. Talk to one of our plumbers about this solution. How frequently should septic tanks be inspected? Once annually every three to four years, at a minimum. Even if you’re not having problems now, full septic tanks might let solids into the drain field, causing it to get blocked and backed up and not work properly. This repair can be quite expensive. How can I get rid of white buildup on my showerhead and faucet? These mineral deposits can be removed easily. Fill a plastic bag with a cup of vinegar, and secure it around the showerhead with a twist tie before bed. Take the bag off in the morning and scrub away remaining deposits with an old toothbrush. If possible, remove dirty aerators from faucets and soak them in vinegar overnight. Over the past year the kitchen drain is running slowly. Should it be cleaned? 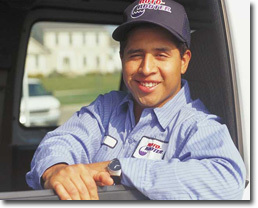 Try a Roto-Rooter maintenance product first, as they are meant to remove typical build up from grease, hair and soap. Plumbers also use these to inhibit the growth of roots in your sewer line. You can get all of these products at your local Roto-Rooter branch. What’s causing the rumbling sound from the water heater when it’s working? This could be sediment buildup at the bottom of the water heater. If boiling water gets trapped in the sediment it can make the rumbling noise. This situation doesn’t allow proper heat transfer, lessening the efficiency of the system. Older water heaters are more likely to have this problem than newer ones. Consider draining a few gallons (within about five minutes) through a hose at the valve at the bottom of the tank. WARNING: Never dispose of the hot drained water in a toilet bowl or onto the lawn, as this can be damaging. Dispose of it into a floor drain, laundry tub or shower. What might cause the occasional whistling sound that seems to be coming from the plumbing system? This could be a slowly leaking toilet fill valve. To find the leak, look into your toilet tanks and adjust the fill valves. Once you discover which valve is at fault, you can replace it. I’ve heard that new toilets don’t flush properly and require multiple flushes. Is there an ideal toilet replacement recommendation? The federal government has mandated that new toilets flush no more than 1.6 gallons per flush. Some of the first attempts to follow this while still sending waste to the sewer line were not successful. Solutions have included a pressurized toilet tank, which look like home toilets but works more like a commercial toilet. They operate well, but tend to be loud. Our plumbers suggest going with a well-established brand like Kohler, American Standard and Eljer. My hot water is hotter than I need it to be. Is there a way to conserve this energy while still having the hot water I do need? 120 degrees Fahrenheit is satisfactory for most people, and is the latest standard when manufacturers pre-set water heaters. In older models, you can set the thermostat to medium. Gas heaters have a dial on the front of the gas valve, while electric models have one or two thermostats that hide behind panels on the tank sides. WARNING: Exposed wires behind these panels contain high voltage, and so turn off your electricity before taking the panels off. We are always running out of hot water, even with only five minute showers. What can we do? One possibility is that the dip tube is broken, allowing cold water that enters the tank to mix with hot water. Gas and electric models can experience this. Another possibility, if you have an electric water heater, is that the lower heating element is not working correctly. In this case, only the top of the tank will warm up. We suggest talking to a plumbing contractor. I cannot figure out why my water bills seem to be rising. Nothing appears to be leaking. Could there be another cause? You may have a leaky toilet. Inspect the water level to make sure the water isn’t overflowing the tank via the overflow pipe, which is in the middle of the tank with small tubing connected. If there is, in fact, water going into the overflow, adjust the fill valve to halt flow about one inch under the top of the overflow tube. You can also set it to the water level marker on the tank’s side. Add a couple drops of food coloring to the tank. If the bowl water changes color within about 15 minutes, water is leaking into the bowl. The ball or flapper most likely needs to be replaced.